Some tech-savvy folks I know, hearing me gripe about restrictive word count limits, wholesale alterations by editors, rejection letters and stingy pay scales, have urged me to take advantage of the opportunity for freelance writers to self-publish their work. I finally decided to take the plunge, beginning with eight short pieces illustrated below. In the course of my writing career, beginning in grad school, I’ve produced seminar reports, conference papers, magazine articles, essays and reviews on a variety of literary and historical topics. Most of these, after their initial presentation, have been relegated to the virtual dustbin of my hard drive, which seems a bit of a shame. After all, these were pieces on which I did some serious work; I took pride in that work, and still do. These first eight offerings of mine on the e-market are equivalent to mid-range to long magazine articles, ranging from 2,000 to 5,000 words, and I think they strike a nice balance. Readers interested in these topics, while they may not necessarily care to dig through a full-length book on them, might want something a little more substantive than what they might get by Googling up a Wikipedia entry. And at only 99 cents each (well, except for one at $2.99), how can you go wrong?! Click on my cover images below (as a self-publisher, I also get to be my own art director!) and check a couple of them out. You say you don’t own a Kindle? Well, that’s no problem: you can can download the Kindle reading app for your PC, at no charge, by clicking on the image below. It’s a very easy installation process, and you’ll then be able to read Kindle e-books on your computer or laptop. Amazon also offers other free apps that let you read Kindle e-books on smartphones and tablets, as well as Macs. I sometimes have to remind folks, some of whom seem a tad skeptical about my claim to be a professional writer, that I don’t content myself with just dashing off the occasional magazine article on jazz or whatever. For the past couple of years, I’ve been working on my second book, titled Pen & Sword: Five Novelists As Soldiers, for which I’ve signed a contract with Algora Publishing , a serious-minded NYC publishing house (check out its Web site). I’m grateful for this opportunity to continue my writing career at a challenging level, and I look forward to presenting this little-known intersection of military history and literary biography. Miguel de Cervantes (1547-1616), who lost the use of his left arm as a young Spanish soldier fighting the Turks in the famed Battle of Lepanto. Afterward, while returning to Spain he was captured by North African pirates and held captive in Algiers for five years. Both episodes appear in his famed Don Quixote, which he wrote years later. Leo Tolstoy (1828-1910), who served four years as a gunnery officer in the Russian Army and saw fighting both against Muslim insurgents in Chechnya and in the Crimean War, including the Battle of Sevastopol. This was why he able to imagine Napoleon’s invasion of Russia so convincingly in War and Peace. Raymond Chandler (1888-1959), who enlisted with the Canadian Army during WWI and was seriously concussed by German shelling, echoes of which can be found not only in his hard-boiled detective novels featuring Philip Marlowe, but in the Hollywood screenplays he wrote, including The Blue Dahlia and Alfred Hitchcock’s Strangers on a Train. George Orwell (1903-50), who (along with many Americans) fought against the Fascists during the Spanish Civil War and caught a bullet in the throat before fleeing back into France one step ahead of Stalin’s death squads. Most people who’ve read Animal Farm don’t know that this, not the Russian Bolshevik Revolution, is the real historical backdrop to that novel. Kurt Vonnegut (1922-2007), who was a POW for a year and half after being captured in WWII’s Battle of the Bulge, during which time he barely survived the firebombing of Dresden, which is mentioned in several of his novels, especially Slaughterhouse-Five. Others, who know about this project, have asked me “What’s taking you so long?” Well … this isn’t some short work of fiction or a personal memoir I’m just dashing off the top of my head here! This is serious history, which takes years to write and requires a LOT of research. In this particular case, I not only have to read the biographies (emphasis on the plural) of each of these fellows, as well as the histories (again, plural) of the war in which each fought, I ALSO have to read the books they wrote in which elements of their combat experiences are found, albeit sometimes in disguised form. This means (re)reading stuff like War and Peace and Don Quixote — not exactly light or quick reading. I just thought I’d put this out there to clarify things a bit. The November/December 2012 issue of Iowa History Journal features a story of mine about Iowa poet James Hearst, an important if lesser-known artist of the Regionalist movement that included Grant Wood and Hamlin Garland. An expanded version of an article I’d previously written for Yahoo Voices, it’s titled “Planting Thoughts” and details the life and work of farmer-turned-writer Hearst, who offered a clear-eyed vision of Midwestern agrarian life that was sympathetic but unsentimental. The timing of my story’s publication was interesting, as I had met Scott Cawelti, a UNI professor who edited The Complete Poetry of James Hearst (Univ. of Iowa Press, 2001), just one week earlier at the Iowa Authors Fair. Scott and I both agree that Hearst was truly an Iowa treasure who is sorely under-appreciated, something we both hope will change eventually. Being myself a Navy veteran, I was gratified to have my article appear with a cover story about the Sullivan Brothers,who died together during WWII when their ship, the USS Juneau, was sunk by a Japanese torpedo at the Battle of Guadalcanal. As I told IHJ editor Mike Chapman, this story has an added resonance for me: the first of two ships named for the brothers, the destroyer USS The Sullivans, after serving in the Korean War, was decommissioned and docked at a memorial site in my hometown of Buffalo, NY — in fact, I once attended a wedding reception held on the ship. 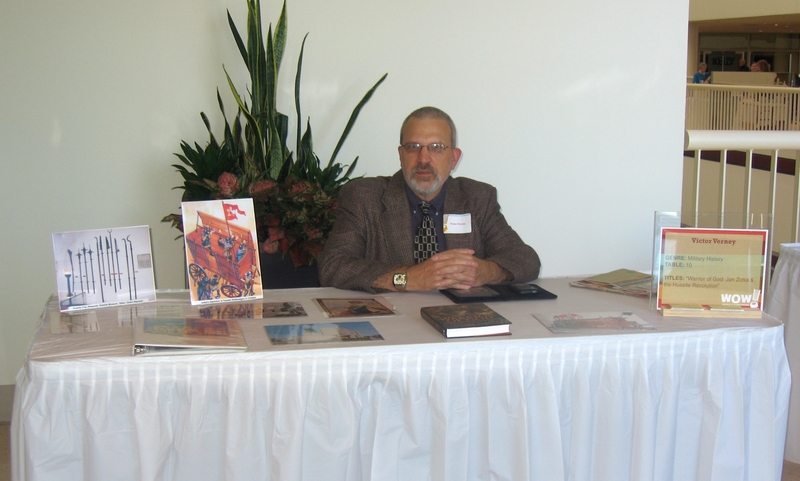 It’s been a while since I’ve participated in a book fair, so I was pleased when Wendy Delsol contacted me and invited me to be a part of the 2012 Wonder of Words Festival, specifically this year’s Iowa Author’s Fair. Titled “Voices from the Prairie” (not necessarily how I think of myself, but when in Rome . . .), this event featured some sixty Iowa writers representing the full spectrum of literary genres. Along with the opportunity to chat with local book lovers — and sell a few copies of Warrior of God, of course — the great thing about these events is the chance to meet other authors, particularly those who share my interest in literature and history. I was especially pleased to get to meet Professor Scott Cawelti, our leading authority on the late James Hearst, about whom I’ve written for Yahoo Voices and Iowa History Journal magazine. Scott, an extremely talented gentleman, is not only a ranking literary scholar and film critic but also an accomplished musician/songwriter as well. I also greatly enjoyed meeting James Patrick Morgans, a Civil War scholar from Council Bluffs who has written three books about the Underground Railroad in Iowa. In particular, his book about John Todd, an abolitionist clergyman who sheltered John Brown during the “Bleeding Kansas” turmoil, is a subject of keen mutual interest, and James intrigued me with several fascinating local anecdotes from that historical period. I was also able to chat with two of my favorite local literary ladies, Alice Meyer, proprietor of Beaverdale Books, and Jan Kaiser, marketing manager for the Des Moines Public Library. Alice and Jan were the driving force of this event, and their tireless efforts to support and promote books — both those who read them and those who write them — rank them among Des Moines’ leading contributors to the local cultural scene. Thomas Wolfe once famously declared that “You can’t go home again.” While that may well be true (and my personal experience tends to confirm that assertion), you can always at least write home via e-mail or an old-fashioned letter. On a professional level, it can be done with a contribution to one’s hometown newspaper or magazine. An old buddy of mine, John McMahon, himself a regular contributor to Artvoice, a weekly magazine out of Buffalo, got in touch with me after the Iowa floods of June ’08 and suggested I might wish to write a story about them from the perspective of a former Buffalonian. I was quite gratified when I learned that the Association of Alternative Newsweeklies featured the story as an “Editor’s Pick,” as seen on its Web site, Altweeklies.com. The AAN represents 129 papers published in 41 states, the District of Columbia and four Canadian provinces, and through its Web portal strives to bring high-quality journalism to an international audience with a different perspective than generally found on wire-service and daily-newspaper websites. Recognition by one’s peers is especially flattering!